The weekly mid-major report focuses on the Rice Owls. The goal of this report is to help the average bettor realize that specialization can be a profitable strategy. Rice was picked at random at the start of the season as the team that I will follow all year long. I’ll be pouring through statistics from every game, reading reports from Rice beat writers, following the players on Twitter, and using information gathering method I can to learn more about this year’s version of the Rice Owls. At the end of each of these articles, I’ll be making a selection on the current week’s game. We will be using Doc’s Sports Unit Betting System for every football pick, which will help users follow along and track results of the picks. The Owls were off last weekend, but they picked up a huge 24-22 win over the Purdue Boilermakers two weeks ago. The Owls blocked a late field goal attempt to hold off the Boilermakers. While Purdue clearly isn’t a top team, a win over any team in the Big Ten Conference has to be a huge confidence booster for Rice. My selection on that game was ‘over’ 50.5, so that was a loser. The score was 17-17 at halftime, but the defenses controlled the second half. There were only five points scored in the final 25 minutes of the game. What was the biggest reason Rice was able to break a 22-game losing streak against BCS opponents? 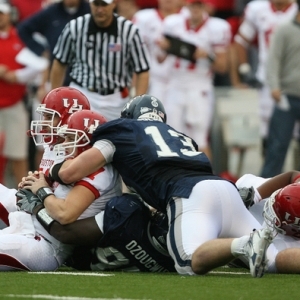 The improved play of the Rice Owls defense was quite evident in Houston two weeks ago. Linebacker Justin Allen made 10 tackles during the game, but it was his blocked kick as time expired that made him the Player of the Game. As we have mentioned before in this report, the return of defensive end Scott Solomon is making a big difference on defense. Solomon had 3.5 tackles for loss and two sacks that came at crucial times in the Purdue contest. Kyle Martens was once again a star for the Owls on special teams. Martens punted seven times, and he managed to average 50.1 yards per punt. On 12 punts this year, Martens is averaging 49.5 yards per punt, and four of those punts have been downed inside the 20-yard line. --In this week’s press conference, Coach David Bailiff spoke about the transition Robert Griffin III has made from being a superb athlete to being an elite quarterback. Bailiff was quick to point out that while the Rice defense has been very good, they will need to do a better job taking advantage of opportunities for takeaways. He said he believes there have been at least three balls that should have been interceptions already this year that turned into incomplete passes. -- Joseph Duarte, the beat writer for The Houston Chronicle, points out the important job that freshman Julius White has for the Rice football team this week. White is serving as the scout team quarterback this week, which means he is working to simulate Griffin III. --While the passing offense was better against Purdue, the Owls struggles on the ground have to be a concern for the coaching staff. The Owls ran the ball 48 times, but they only picked up a total of 110 yards rushing. --Rice is 2-9 ATS in their last 11 games against a Big 12 Conference opponent. --Baylor is 5-1 ATS in their last 6 games against an opponent from Conference USA. --The ‘over’ is 8-2 in Baylor’s last 10 games. Rice opened as 18-point road underdogs, and the public money continues to push the line even further toward Baylor. The Bears are now 20.5 point favorites in this intrastate showdown. While there has been big movement on the side in this one, the total has stayed steady at 67 points. The win over Purdue was big for the Owls confidence, but Baylor will be the best team they have played so far this season. The Rice defense has improved from a year ago, but I don’t think they are good enough to slow down Griffin and the Bears extremely athletic offense. Baylor beat the Owls 30-13 in Houston last year, and I think they’ll win even easier this weekend. There isn’t really anyone out there who can simulate the way Griffin quarterbacks a team, and I think Rice will be in for a long game this weekend. The pick for this game is on Baylor -20.5. Keep an eye out for next week’s report, which will feature a review of this game and a pick on next week’s matchup with Southern Mississippi.